"I offer my sincere condolence to all of Hodges family, i..."
Phyllis Elizabeth Hodges Chance, age 70 of Marianna, FL passed from this life on Thursday, February 7, 2019 at Doctors Memorial Hospital in Bonifay, FL. 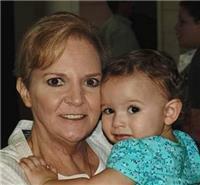 She was born on September 8, 1948 to the late Riley C. and Margaret (Hersey) Hodges in Marianna, FL. Phyllis has been a lifelong resident of the Jackson County area and she is a member of New Salem Baptist Church of Marianna. Along with her parents she is preceded in death by one brother, Wendell Hodges, one sister, Faye Hodges and two son in laws, Glen "Skip" Delph and Brandon Hatcher.